JM Fencing & Garden Services - Fencing/Gates, Landscaper based in Swalwell, Tyne and Wear. 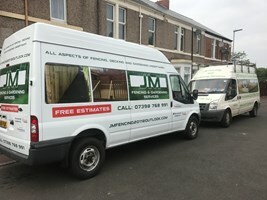 JM Fencing & Garden services are a family run business, operating in and around the Newcastle/Gateshead area. The company was set up over 3 years ago with a combined 15 years’ experience. Can’t decide? Call us we are always happy to help. Free no obligation quotes provided.